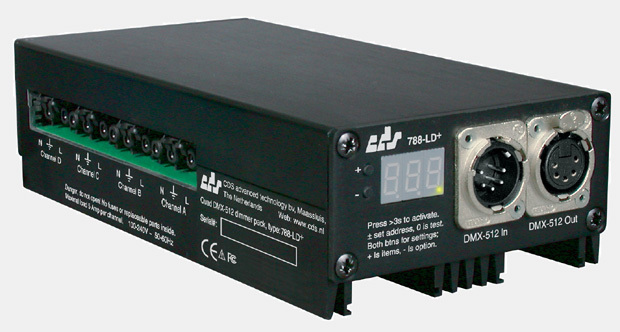 The 788-LD+ is a four 5 Amp channel compact DMX dimmer pack that can be used in any DMX-512 environment. The CE qualified dimmer can control the intensity of (or switch) four 5 Amp channels in 8 or high resolution 16 bit mode, complies to "DMX512-A", ANSI E1.20 RDM, and is conduction cooled (no fan). The 788-LD+ (version 2) can be set to 16 bit mode, in which it can dim from 0 through 100% in 1024 steps instead of 256. This makes very smooth dimming of e.g. FL tubes and LED possible, but uses 8 DMX addresses for the four channels. The high resolution mode can be set via option H=1, while H=0 set the pack to the default 8 bit resolution. Note: The v2 can be recognized, as it has the XLR connectors behind the front panel, as in the picture on top. The 788-LD+ can be set to any DMX address using the LED display (which is auto turned off) and two buttons. The channel options can also be set this way. The 788-LD+, with firmware v5 or later has ANSI E1.20 RDM support. This means that with a suited RDM controller, you can configure the pack (start DMX address, 8/16 bit personality, dim/switch channel personalities, etc.) from a distance location. Even the triac temperatures, and overloads can be seen on your (e.g. Enttec or AL) RDM controller. So, now you can put your dimmer near the lamps, and don't need to climb anymore to set the DMX start address! The DMX dimmer pack is fed through a single 100-240 Volt AC line, it has no fuses but uses a state of the art electronic protection scheme against short circuit and overload. Sensors in each filter coil monitors temperature overloads, while the total current is also measured. The 788-LD+ DMX dimmer pack is ideal for controlling simple off-the-shelf halogen lights, but works equally well with professional lighting equipment. Inductive loads (like low voltage halogen lights, air vents or neon lights) are dimmed perfectly, without annoying hums or damage to the transformers. Includes GST-18/3 plugs, safety cord and hook & loop straps for truss mount. Download the 788-LD+ User's Manual here. 4 independent channels using DMX-512 protocol. 8 DMX addresses used in 16 bit mode (high resolution). Dim, switch, off or on mode for each channel. Both ordinary and halogen light (or other inductive loads). Shock resistant, extruded aluminium housing. Max. load 5 Amp per channel at 25º Celsius. Two 5-pole XLR DMX connectors. Address setting with display and buttons. Isolated DMX, no more ground loops. Produced under ISO 9001 quality control. No fans, very low noise. Copyright 1995...2007 LanBox is a registered trademark of CDS advanced technology bv. All other names referenced are the service marks, trademarks or registered trademarks of their respective companies.